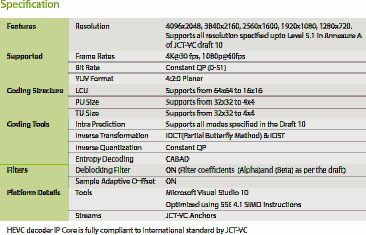 Tata Elxsi announced the availability of a licensable HEVC Ultra HD (4K) Decoder @ 30 fps during NAB 2013. Tata Elxsi, one of the early implementers of HEVC codec, is leading the way in next-generation video technology.Tata Elxsi's HEVC Ultra HD (4K) real time decoder allows rendering of high quality video content to deliver high performance digital user experience, and is suitable for applications such as Video on Demand, converged communication, gaming consoles and proliferating smart CE devices. HEVC codec’s multi-threaded architecture is efficient and suits the ever-growing need for high-resolution video in applications ranging from mobile web streaming over high-quality TV broadcasting to very low bit-rate video conferencing with low latency. HEVC achieves about 50% bit-rate reduction at the same subjective video quality as compared to its predecessor H.264.